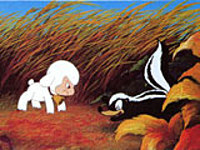 Plot Summary: A little lamb's life is turned upside down by the wolf that killed his mother. He seeks to avenge his mother, but in order to defeat the wolf, he must become one. "I Am Chirin" by ?? ?